If by any chance you paid or deposited in additional to the IRS over your tax liabilities while filing an excise tax return, you are liable to get a refund when IRS approves it. IRS Form 8849 makes this possible for you, when you file claims you get the additionally paid dollars back. IRS usually pay’s you back in check by sent it to your mailing address. Ensure choosing the right schedule when filing claims for excise tax refund. Use form 8849 Schedule 1 claims’ for non-taxable use of gasoline, non-taxable use of aviation gasoline, non-taxable use of undyed diesel fuel, non-taxable use of undyed kerosene, kerosene used in aviation, non-taxable use of alternative fuel, non-taxable use of a diesel-water fuel emission, and exported dyed fuels and gasoline blend-stocks. If you are a registered ultimate vendor use form 8849 Schedule 2 claims for undyed diesel fuel, kerosene, and undyed kerosene that have been used in aviation, gasoline, and aviation gasoline. Form 8849 Schedule 3 claims is used to claim credits that are alcohol fuel mixture credit, biodiesel or renewable diesel mixture credit, and alternative fuel mixture credit. Form 8849 Schedule 5 claims is used for refund of second tax filed for various fuel types such as aviation gasoline, diesel fuel, kerosene, diesel-water fuel emulsion, kerosene for aviation use, kerosene for commercial aviation use, diesel fuel, and gasoline. Use form 8849 Schedule 6 for all other claims reported in Form 2290, Form 720, Form 730, and Form 11-C.
Sold/Destroyed/Stolen Vehicle Claims can be claimed using Form 8849 Schedule 6. Under mileage Vehicle Claims and over paid tax dues can also be claims using Form 8849 Schedule 6. Form 8849 Schedule 8 is for registered credit card issuers to claim refunds on sale of certain taxable fuel such as diesel and kerosene to state/local government or to non-profitable educational organizations. This has been the most frequently asked questioned to us. Customers call us and ask if they can file a claim multiple times in one quarter. Well, the answer is No. You’re not allowed to file a claim more than once in one quarter. So it is advisable to double check and file your claims. At this point of time, excise tax refunds are not distributed online. You will receive your claims in the form of paper checks. Currently, IRS is working on electronic refund option as well. So let’s wait around, you can access your refunds online in a while. Well, this is one subject asked by all since the time E-filing has taken its vows. As it is easy, accurate, and fast, you tend to save much time and also some dollars. The advantage here is that you could zero down all possible human errors while preparing a claim and avoid delays in processing your claims. When you do a claim request online, it reaches IRS instantly for processing and you’ll receive an acknowledgement right away. If you have missed out something that does not match with IRS record you return would get rejected, you may correct it instantly and resubmit it to the IRS for processing. Once IRS approves your claim, the money you owe back is paid in check, sent to your mailing address quoted in the return previously filed with the IRS. If you choose e-file your check would reach you fast over paper filed returns which takes months. With taxexcise.com, you can sit back and relax; we’re protected with Thawte SSL certificate, a leading Global Certificate Authority and McAfee Secure, making sure to serve you with the best and the secured website to file your return online. Also, we always tell our customers to check if the site they’re filing with is secured and IRS certified because as the technology is moving rapidly, number of frauds are increasing. Skeptical to use your credit card thinking something might go wrong? 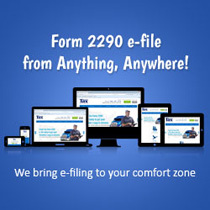 Well, with taxexcise.com, you can stay assured and file with confidence, as we are categorized as the most authentic IRS certified e file service provider and the most Trusted. At Taxexcise.com, we maintain privacy, providing the assurance for a secure e-filing process and avoid misuse of information. You’re important to us.